Indeed, these words were spoken by José ‘Pepe’ Mujica, president of Uruguay, as he described the treatment of countryman Luis Suárez during the 2014 World Cup. Mujica concluded his mandate on March 1, leaving office with high approval ratings and a worldwide reputation for humble living and brutal honesty. 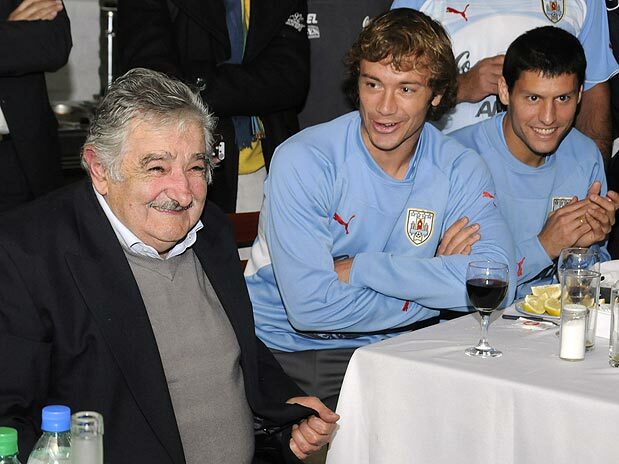 Mujica also shared a close relationship with the Uruguayan national team. A more interesting quote can be found from Mujica’s intimate meeting with the Uruguayan squad, days before they set off for South Africa in 2010. Reflecting on his evolution from guerrilla fighter to democratic leader, Mujica reminded the players that ‘this is a sporting celebration, but not a war’. Undoubtedly there were grumblings amongst AUF officials. Perhaps the players were also confused. Indeed, this was yet another generation of Uruguayan players where the ‘garra Charrua’, the ability to overcome odds through sheer grit and inner strength, seemed to dictate most of their competitive matches. Unsurprisingly, Mujica’s words fell on deaf ears. The national team went to South Africa and fought like warriors in one of the more physical World Cups in recent memory. The road to fourth place was hardly a celebration of beautiful football. Once again, the nation achieved success by sitting back and suffering. Mujica’s words in 2010 are relevant to both his presidency and the Uruguayan national team. Idealized words cannot change old habits overnight. Just as Mujica was unable to curb Uruguay’s hunger for consumption, Oscar Washington Tabárez has been unable to change the passive and unimaginative style which has characterized Uruguayan football for decades. Although yielding impressive results in senior and youth national sides, Tabárez has overseen the continuation of this core mindset across Uruguay’s national teams. The continuation of the ‘garra’ myth has unfortunately seen a potentially beautiful footballing nation unable to free itself from this siege mentality. Similar to the Broad Front government, Tabárez has begun a third consecutive mandate, to guide Uruguay to the World Cup. The government will continue its program to create a happier society through the lessening of injustices. Tabárez has similar goals. In Uruguayan football however, injustice and suffering seem to be the prerequisites to success. Happiness comes later. Jose Mujica was indeed one of a kind. Embarrassing gaffes and political miscalculations aside, he was blunt, honest, and sincere in his words. His 2010 appraisal of Uruguayan football should not be forgotten, nor dismissed. Uruguay will always find success. They will also always suffer. It is up to Tabárez however, to decide the manner in which these will be achieved. I can remember also another wise words of Mujica after the Uruguayan team was back from Southafrica.I don’t remember the exact words, but it was something like “One can see that a tree is great when it falls down”. And I think that this Uruguayan team in South Africa didn’t get this fourth place by playing again powerful teams (South Africa, Korea, Mexico, Ghana), but it showed all its potencial in the match against Holland.